Why did Xi Jinping bow to a statue of Genghis Khan? What are Beijing’s interests in Mongolia? How does the Mongolian government seek to preserve its independence when surrounded on all sides by two very powerful neighbors? Will Sino-Indian Relations Get ‘Modi-fied’? Modi of the campaign trail showered harsh rhetoric on China and its allies in Islamabad. Prime Minister Modi may have to steer his people through regional and global transformations in a more diplomatic manner. The fate of a third of humanity – and perhaps more – depends on a relationship that is fraught with both immense potential and perilous possibilities. There is plenty of room for legitimate criticism of China’s international policy. However, US media have played up “the Chinese threat” to an irrational degree—by omitting context, adopting incendiary language and occasionally using simply inaccurate data—highlighting media bias more than the regional situation. In the absence of any hard evidence about the fate of the plane, speculation will endure and rumors will continue to grow. This is especially true in China, where official restrictions on media create an environment where rumors – even truly outlandish ones – can thrive. The various theories are of course interesting in their own right. They also reveal important trends in the popular Chinese imagination. China is locked in a bitter territorial dispute where the plane went missing, including with the governments of both Vietnam and Malaysia – thus the theories blaming the Vietnamese or the Malaysians themselves. China is also increasingly concerned about the growing American military presence in the Pacific, the threat of terrorism, and domestic political intrigue. The persistent rumors about Malaysia Air Flight 370 provide a rare window for outsiders into the popular anxieties of contemporary China. China is making economic and military inroads into the Indian Ocean, as the vast waterway carries hundreds of billions in trade goods and raw materials to and from China’s shores. China’s rivals in New Delhi are paying close attention, and there are potential fears of great-power confrontation, with the nations along China’s proposed “Maritime Silk Road” taking sides, either with China or against it. However, there is also the possibility of mutual benefit, as trade booms in the region. Beijing’s ambitions in the Indian Ocean were highlighted by the recent visit of Sri Lankan Foreign Minister G.L. Perris to Beijing. Chinese leaders pledged over four billion U.S dollars for construction of a new port in Sri Lanka, as well as billions more in infrastructure investments. A free trade agreement between the two countries is in the initial stages of negotiation. There are still few details available on this proposed “Maritime Silk Road”. In October Chinese President Xi Jinping floated the idea during a visit to Indonesia. Premier Li Keqiang added some financial muscle to the plan in Brunei, pledging roughly half a billion dollars to support the initiative. When discussing the plan, Chinese officials consistently stress maritime connectivity, disaster management and fisheries cooperation. Of course, the most vital Chinese interest along the Maritime Silk Road is trade. China is now the world’s largest trading nation, having displaced the United States within the last year. The vast majority of China’s booming trade with Europe and Africa – as well as China’s vital imports of Middle Eastern oil – must travel through the Indian Ocean. These indispensible trade routes pass through the strategic bottlenecks of the Red Sea, the Persian Gulf, and the Straits of Malacca. Beijing’s extensive (and potentially vulnerable) commercial interests in the Indian Ocean have spurred Chinese investment in military resources. Earlier this month Chinese naval vessels took the unprecedented step of traversing the Lombok Strait in Indonesia and approaching Australian territorial waters. China has also been increasingly active in international efforts in the west Indian Ocean against Somali piracy. American officials have long accused China of engaging in a “String of Pearls” strategy to lock in commercial and military assets in the Indian Ocean. This alleged stratagem involves deepening ties with (and military investments in) Burma, Bangladesh, Cambodia, Pakistan and Thailand. Beijing’s recent overtures to Sri Lanka would be consistent with such an effort. Yang Jiechi, Beijing’s Special Representative to New Delhi, has invited India to join the Maritime Silk Road project. Indeed, so long as the project focuses on trade, open access in potential shipping bottlenecks, environmental issues, and anti-piracy, there is a huge potential for mutual benefit between the two powers. India, like China, is heavily reliant on sea-bound trade, including massive imports of Middle Eastern hydrocarbons. If China can avoid over-militarizing its Indian Ocean interests, then New Delhi may be brought aboard the Maritime Silk Road project – to the benefit of both powers. However, there remains a very real risk of a militarized rivalry, with both camps lining up allies. Given the tense situation in the Pacific, China has a keen interest in keeping the Indian Ocean open for business. “Sri Lanka to sign landmark trade pact with China soon”, The Hindu, February 14, 2014. “Foreign Ministry Spokesperson Hua Chunying’s Regular Press Conference on February 13, 2014”, Ministry of Foreign Affairs of the People’s Republic of China”, February 13, 2013. “US Draws Own Line Over South China Sea Dispute”, Radio Free Asia, February 9, 2014. “China builds up strategic sea lanes”, The Washington Times, January 17, 2005. “Troops to economy, army cells to keep a watch on China”, Hindustani Times, February 17, 2014. “The String of Pearls and the Maritime Silk Road”, China-US Focus, February 11, 2014. “India invited to join Maritime Silk Road initiative”, Business Standard, February 14, 2014. 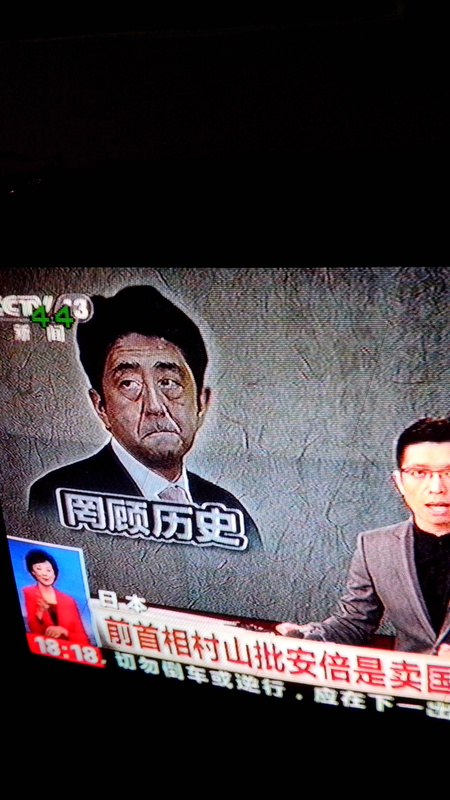 China Central Television is having a field day making Japan’s Prime Minister look bad. Of course, Abe has given China’s state-controlled broadcaster plenty of ammunition. His recent visit to the Yasukuni Shrine and his plans to beef up Japan’s military provide excellent distraction from issues of pollution censorship and corruption. The successful landing of China’s first lunar vehicle represents a significant leap for Beijing’s ever-expanding space program. Chinese media is now reporting that Yutu has successfully reawakened after a potentially dangerous two-week hibernation to ride out the darkness of the lunar night. Yutu can now continue its detailed mineral survey of our planet’s nearest neighbor. Yutu is interesting in its own right. It is also an important symbol of China’s growing interplanetary ambitions. As the space programs of other nations slow down, Beijing continues to make significant investments in exploring our solar system – investments Chinese leaders expect will have significant payoff. Yutu’s soft landing on the lunar surface came just a few days after a serious incident on the International Space Station (ISS). A cooling pump malfunction resulted the suspension of non-essential activities on the ISS. Astronauts went on emergency spacewalks to fix the cooling system. In the worst-case scenario, this problem could have led to the abandonment of the ISS. Even by the most optimistic estimates, the ISS will remain serviceable only until 2028. If it is still operational by that time, it will probably have a neighbor in low Earth orbit. Beijing has a publicly stated goal of launching a permanently manned space station by 2020. Just last year, Chinese astronauts conducted their first successful orbital docking procedure. Barring any unforeseen events, China could have humanity’s only operational space station in roughly a decade. China initially sought to join the International Space Station, but was blocked by the United States over fears of Beijing obtaining “dual-use” weapons technology. In 2007, China successfully tested anti-satellite ballistic weapons. Finally, there is a very real possibly of reaping astronomical economic rewards. In 2012 Planetary Resources, a commercial space mining company, announced its intention to “add trillions of dollars to global GDP” through asteroid mining. Some outside observers worry about China’s ongoing space achievements, and call for America to launch a new space race. However, NASA’s budget has been seriously constrained in recent decades. Even ongoing, technologically viable missions, such as the Cassini spacecraft currently orbiting Saturn, may have to be scrapped for budgetary reasons. Chris Hadfield, a Canadian astronaut who visited Russia’s Mir station in the 1990s has another proposal for dealing with China’s growing space ambitions: “I think right now a lot of people see it as kind of crazy to co-operate with the Chinese, but I think it’s the next logical step.” He believes China should be brought onboard an international mission to return human beings to the surface of the moon. Some countries, most notably Russia and Germany, have already begun cooperation with China’s space program. China’s efforts in space follow in the footsteps of the American and Soviet programs. China’s orbital vehicles are largely based on Russian designs. According to some media, China’s relatively late start means that other countries shouldn’t be too concerned about Chinese efforts in space. However, a historic parallel from China itself serves as a warning against self-satisfied complacence. In the early 1400s, China’s Ming Dynasty had the greatest fleet the world had ever seen. Massive ships carried thousands of Chinese sailors from southern China to India, Persia, and Africa. Utilizing expert shipbuilding technology, the Chinese were able to transport giraffes and rhinos back to the Ming Court in Nanjing. Despite its huge technological lead on contemporary nations, Ming China abandoned its oceanic exploration for political and economic reasons. New leaders believed that maintaining relations with distant lands was too costly, and had little value for their great empire. European adventurers ended up reaping the benefits of oceanic trade, and within a few centuries China was left far behind. Space has immense strategic, scientific, political, and economic potential. China’s leaders would not make such huge investments in space if they did not expect concrete benefits. The rules that apply on Earth may extend beyond our planet: first contact is less important than a sustained presence.